Moving house is stressful enough on its own, without having to worry about breaking your most valuable items on the way. If you want to get your breakables to your new home in one piece, there are a few simple measures you can take to get them there safely. If you leave it until moving day to pack your items, there will be breakage. It takes time to do it properly, so start early with your most fragile and most precious items, and if you end up in a rush, it will be the shoes and pillows that get tossed in at the last moment. Packing your most fragile items in the days before you have to move means that you’ll have time to do a good job, and you won’t forget things at the last minute, like correctly labelling your boxes. It’ll also give you time to sort and group your boxes, so your movers can load your boxes in the right order. The right packing materials will protect your fragile items from breakage, whether the risk is during handling or transport. It might seem like a hassle, or an unnecessary expense, but investing in good quality protection could save you replacing expensive items, or losing the irreplaceable ones. There’s a reason why removalists use cardboard boxes: they are easy to handle even when they’re heavy because they’ll sit properly on a trolley, they’ll slot securely beside each other during transport because they aren’t an awkward shape, and they’re firm enough to protect the contents inside from damage. Getting proper moving boxes, that are designed to hold up even when filled with heavy items, is essential if you’re determined to move your items without accidents. Packing peanuts: to fill out space. They do move around a fair bit, so they are better used with together with other materials, and they aren’t suitable for extremely fragile items. Bubble wrap: to wrap smaller items, or as extra wrap for larger ones. Kraft or other heavy duty packing paper: used to wrap around objects, pad out space in boxes, or to wad into glasses and other hollow items. Inflatable packing pillows: sometimes a good alternative to wads of packing paper. Sheets of Styrofoam: to pad out spaces in the box or wrap items. Specially designed boxes for tableware: there are boxes with strong, built-in dividers to save much of the stuffing and wrapping involved with cups and plates. There are also corrugated cardboard dividersavailabel to safely separate items. Tape: to ensure the flaps won’t flip open and spill the contents. 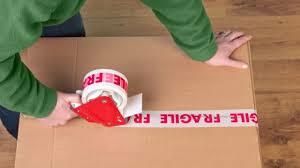 Labels or pens: to clearly label your boxes detailing what’s inside, which way up to store and handle it, and to indicate that the contents are fragile. Avoid using towels, clothes, pillows or other household items for packing: they won’t absorb as much energy from bumps and knocks as proper packing materials will, they can’t be taped, and they will often shift around inside the box. A lot of breakages happen because of things you didn’t know, like which way up to pack plates and mirrors. But there are a few tricks of the trade to secure the most common fragile items for transport and help you get them to your new home safely. Plates should be packed vertically, not horizontally. Bubble wrap them and make sure there’s a wad of packing paper or a corrugated cardboard divider between each one. Make sure the inside of the box is packed to the sides, top and bottom with packing paper. Glasses should be stuffed with crumpled packing paper, then wrapped in packing paper, bubble wrap or Styrofoam sheets. They should be stacked with the heaviest on the bottom, and the box should be tightly packed with wads of paper. Wine bottles have special requirements. They shouldn’t be exposed to extreme temperatures, so if the journey to your new home is a long one and your collection is valuable, you might need to consider climate-controlled transport. There are specially designed packing boxes for wine, and removalists usually have a good idea of how to pack and transport it, so ask for some advice if you’re not sure. Mirrors and picture frames should be packed in boxes the right size for the mirror. If you can’t buy one to fit, you can make one out of other boxes. Fill the bottom of the box with to the edges with packing paper, wrap the mirror in a few layers of bubble wrap or paper, then fill in the front and back of the mirror with more wads of paper. The most important thing is to transport mirrors vertically, not horizontally, and they should be secured with moving blankets around the base when they’re in motion. Computers, televisions, and other electronics are best packed in their original boxes with the custom designed Styrofoam packing that they came in. If you don’t have the original boxes, use regular moving boxes and lots of paper padding, and remember to protect the screens and surfaces to stop the power plugs and cable connectors from scratching. Lamps are awkwardly shaped, and the two main pieces need to be packed in different ways. Remove the shade from the stand, and box the shade separately with lots of padding. The base is sometimes an irregularly shaped sphere, so lie it on its side on bubble wrap or paper, use packing paper to fill any gaps at each end, and then roll the paper around it. Other awkwardly shaped items can be completely wrapped in bubble wrap or paper secured with tape, wrapped in pliable corrugated cardboard which is also taped, and packed into well-padded boxes. Your removalist will automatically check your boxes to see whether they are marked as fragile, or with instructions on which way up to store or move them. But at any time, if you are unsure whether you’ve packed your fragile item properly, or you want to be extra sure they will be careful, speak up. If the idea of packing your items yourself is overwhelming, contact Faulkner Removals for information on our full suite of packing materials and boxes, and our expert packing and transport services in Brisbane. We can help you get your fragile items to your new home fast, easily, and in one piece.